Rob Cesternino and Akiva Wienerkur are fresh from earning their doctorate in podcasting and are ready to bring you the next Seinfeld Post Show Recap . 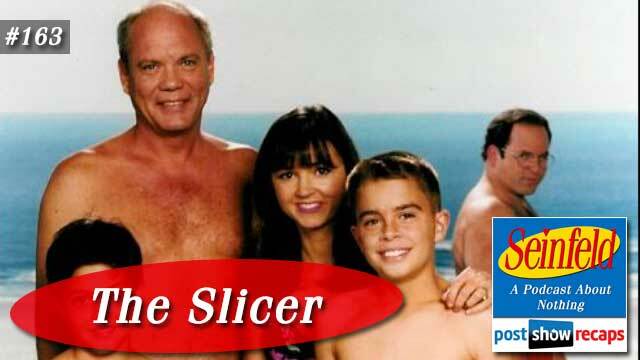 This time the guys discussed “The Slicer”, which first aired November 13, 1997 as part of season nine. The episode was written by Gregg Kavet, Andy Robin and Darin Henry. Emails – Johnny De Silveira shared how he enjoyed the callback to Kramer’s fear of clowns in the Joe Devola episode. Lindsay asked the guys if they’ve purchased any useless kitchen appliances. Mikewrote in wondering if Nicole belittles Rob about how she saves lives every day. Shawn Falconer checked in, noting that the Kenny Kramer Tour schedule won’t be out until later this summer. Craig pointed out the discrepancy in George’s hairline in the series premiere versus the 1989 in that photo. Pat asked why George didn’t just leave the picture alone. Amir wondered why Elaine wouldn’t just call the super of the building. Finally, Chester chimed in with an array of takes. Tune in next week as the guys will recap “The Betrayal”. Send in your questions by emailing[email protected]. Don’t forget to subscribe to the podcast by going topostshowrecaps.com/seinfelditunes where you can rate and review the podcast. You can get a discussion going by leaving a comment on the show pages, and as always, you can follow them on Twitter @robcesternino and @keev26.